Editor-in-Chief Dr. Ze Zhang, Coker College, USA. 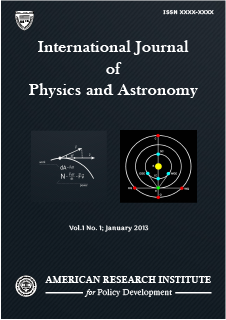 International Journal of Physics and Astronomy is an international journal devoted to the promotion of the recent progresses in all fields of physics and astronomy. The aim of the editors is to publish timely, useful and informative results that will be of value to a general audience. Every article published in our journal is promoted to researchers working in the respective fields. All research articles published in the journal have undergone rigorous peer review, based on initial editor screening and anonymized refereeing by at least two anonymous referees. Each paper published in International Journal of Physics and Astronomy is assigned a DOI®number, which appears beneath the author's affiliation in the published paper. Click HERE to know what is DOI (Digital Object Identifier)? Click HERE to retrieve Digital Object Identifiers (DOIs) for journal articles, books, and chapters. Dr. Ze Zhang, Coker College, 300 E. College Ave., Hartsville, SC 29550, USA. Dr. Krassimira Ivanova Kardjilova, Technical University of Varna, Bulgaria. Dr. Abolghasem Zare Shahneh, Dept. of Aerospace, Cranfield University, UK. Dr. Konstantinos Kalachanis, University of Athens, Greece. Dr. Raymond Limen Njinga, Department of Physics, Ibrahim Badamasi Babangida University, Lapai, Nigeria. Prof. Dr.Laith Ahmed Najam, Department of Physics, Mosul University, Iraq. Dr. Syed Karrar Haider, National University of Computer & Emerging Sciences, FAST, Lahore-Pakistan.